J&K Directorate of Social Welfare Jammu Submission of On-line scholarship applications under Post-matric Scholarship Scheme from students belonging to Schedule caste (SC) Other Backward Classes (OBC), Economically Backward Classes (EBC), Physically Challenged (PCP) & Denotified Nomadic & Semi Nomadic (DNTs) Categories for the year 2018-19. URL:- https://jk.gov.in/jkeservices. Only online applications under these Schemes will be accepted. To avail the Scholarship service a candidate has to log in URL:-https://jk.gov.in/jkeservices and before applying the Service, User has to register using the Register Link given on the menu. Please, note application ID, password the Citizen ID after successful registration as it will be required at the time of availing the service. After login, Applicant has to click on the e-services tab in the left menu arid thereafter click on the social welfare and under social welfare click on Post-matric Scholarship. For further queries, the candidates can contact Assistant Director (Schemes)/ scholarship section. Directorate of Social Welfare Jammu on telephone No. 0191-2472600. The value of scholarship as per Govt. Norms include maintenance allowance plus non -refundable fee compulsorily payable by the student, studying in Government or Government recognized educational Institutions by the Government/UGC/Board of Technical Education and similar Statutory Professional Councils of India for recognized, courses. Hard copy of the form submitted directly to this office shall not be entertained. 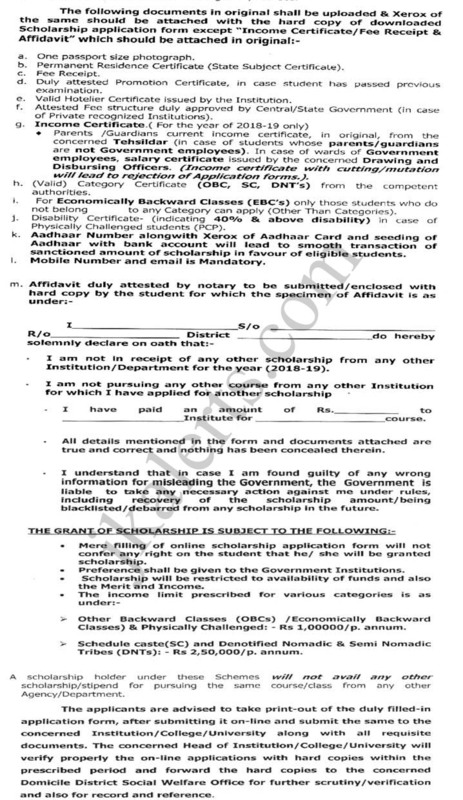 The concerned Institutes/College/Universltics are requested to approach concerned District Social Welfare Office / Directorate of Social Welfare Jammu with their recognition/registration certificate along with Name, e-mail and Contact details for uploading & generating of User ID and Password for on-line verification of application on State Portal. For Post / Pre Matric Scholarships for J&K Students Upcoming notifications Selection Lists and update Free Job Alerts and Updates Keep Visiting Jkalerts.